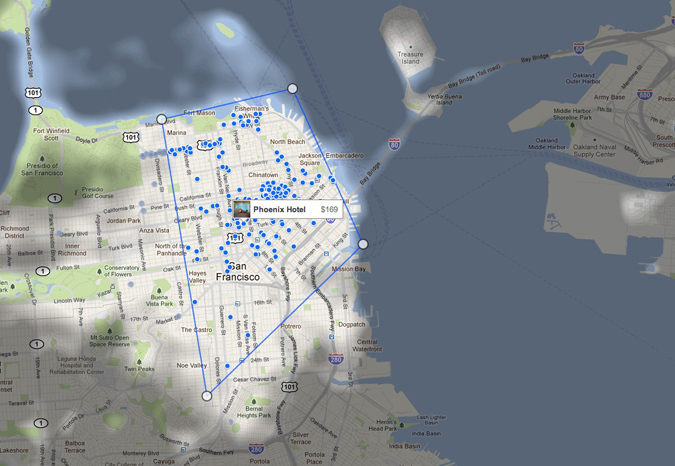 Infographic Of The Day: Google’s Hotel Finder Is D.O.A. Travel booking, more than most industries, is primed for a game-changing disruption. Consider: Orbitz, Travelocity, and Hotwire have all merely rearranged the deck chairs on a pretty crappy user experience. None of those services are particularly good at telling you where to stay; they’re simply designed to help you find a good price once you already have a place in mind. That last feature is particularly useful, given how iterative the process of planning a longer trip can be — how often do you juggle a half-dozen tabs in your browser, keeping them all open, under the expectation that you’ll eventually get around to comparing them more closely at a later time? 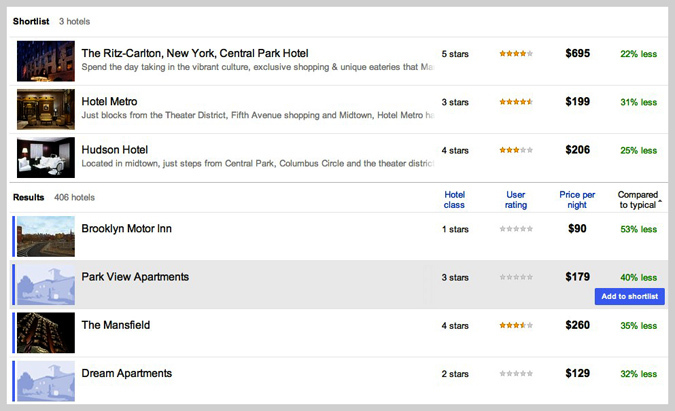 But isolated from any broader service, such as a full on itinerary tracker or traveller ratings, that one feature clearly isn’t enough to draw any users. It’s a bonus, not a lure. And that whole idea of seeing whether a hotel price is significantly below the norm is a total red herring. If you’ve ever travelled anywhere, you know that hotels that are selling their rooms at a steep discount tend to be terrible. The ability to find a heavily discounted hotel is great for cheapskates, but it doesn’t actually tell you what sort of value you’re getting for your money — and value, as measured by quality of hotel vs. price, is surely what most travelers are after. Hipmunk was founded on a shoestring by a recently graduated kid out of MIT. How on earth is Google, armed with a cash-printing machine and the best software engineers on the planet, getting outsmarted by a tiny startup? Employees at the search giant are fond of touting the mantra that unless you’re constantly failing, you’re not trying to innovate. But I’m not sure at all whether “innovation” truly resides in launching a bunch of half-assed products whose inevitable failure will most likely convince your managers that they never should try that again. In other words, failing without any prospect of success isn’t a good idea. Those failures tend to simply shut down the chances of pursuing future innovations. Failures instead should be instructive, and lead to more innovation rather than less options. Certainly there’s more in store for Hotel Finder, long term, especially considering Google’s recent acquisition of flight info software company ITA. But why jump the gun, now? Granted, Google+ has been a very impressive stab at creating a social-networking UI. But it was also preceded by countless products from Buzz to Wave that seemed never to ask, “Who would actually want this?” As Google grows, its willingness to float bad products is starting to seem a little bit familiar to Microsoft, ten years ago. You know what’s also familiar? It’s dependence on a single cash cow that keeps them from caring whether any single side venture lives or dies. The direct contrast of course is America’s best design-driven company, Apple. Steve Jobs would rather die than release any new product that wasn’t a step-wise improvement over everything that existed before. That’s the mentality of someone that cares about whether people use a product. Google’s mentality is that of an engineer, content to labor over one cool feature at the expense of creating any overarching value. As the example of Microsoft vs. Apple showed us, the engineer’s mentality can win early in a product cycle, when new features can create great advantages over competitors. But over time, as the tech gets commoditized, it’s the companies like Apple, which are focused on integrating all the features, that create world-changing products. Which one do you want to be, Google? I’ll bet you’ve already decided, and you just don’t realize it yet.